Your pet would love for you to stay home and play with it all day. Unfortunately, you have to go work. 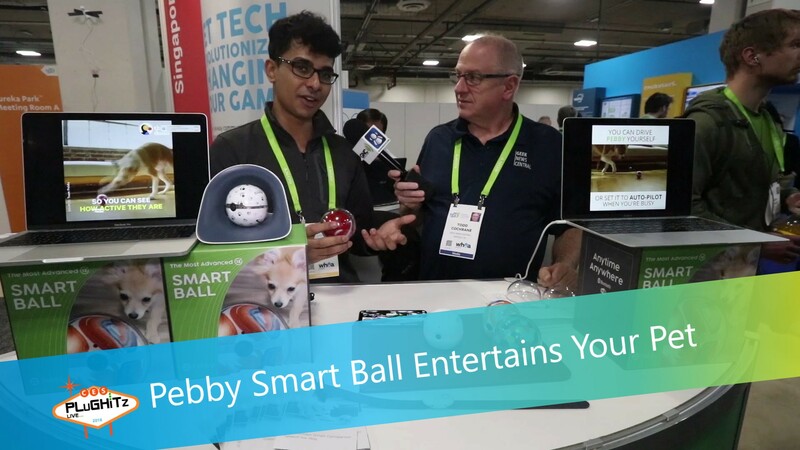 Pebby is a smart ball that entertains your pet while you are away. Best of all, the Pebby app allows you to remotely interact and play with your pet from anywhere. Todd visited the Pebby booth at CES 2018 and spoke with Thinesh. The Pebby ball has many ways to entertain your pet. It allows pet owners to talk to their pets, record videos, and snap photos. The Pebby ball has a camera in it that connects to the Pebby app. Pet owners can maneuver the Pebby ball via the app by using the joystick icon. The Pebby ball can make sounds. Press the cat icon on the app and the Pebby ball makes a "meow" noise. Press the dog icon and the ball makes a "woof" sound. Talk into the app, and your pet will be able to hear you through the Pebby ball. The Pebby ball has a laser on it that pet owners can use to entertain their cats. Put a Pebby collar on your pet, and it unlocks the auto-play function. The Pebby ball will follow your pet and encourage your pet to play. To recharge Pebby, roll it into the Pebby wireless charging dock. Four hours of charging time gives you two hours of optimal non-stop playing and 12 hours on standby. You can preorder Pebby for $189 USD. Pebby is expecting to deliver in Quarter 2 at $249 USD for the Pebby ball, Pebby dock, and Pebby smart collar.